The most manageable way to deal with rubbish and junk that’s accumulated at your place is to use specialised assistance, not just by any service provider out there though, but by the most efficient and reliable junk removal company in Elmers End – which would be yours truly. We deal effectively with the safe removal and responsible disposal of all types of nonhazardous domestic waste. We have permits for using all recycling depots in London, which means the company can remove and dispose of recyclables like plastic, paper, wood, metal and glass, also discarded or leftover construction supplies, as well as WEEE Directive waste (including dismantling). Of course we have the brains and brawn to deal with after builders and post renovation junk, garden debris, green refuse, backyard junk, garage and basement rubbish and what not. 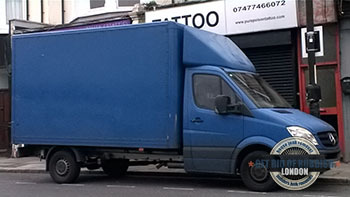 In order to keep our junk removals in Elmers End efficient, reliable and safe we work with trained and qualified clearance teams who go about their duties with professional pace, precision and efficiency. In cases where we perform top to bottom house clearances, our crews will even sweep out the premises after completing the job so you have one less thing to worry about. 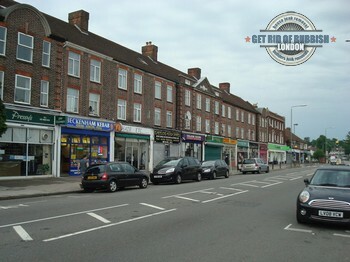 In addition to our general purpose rubbish removals in Elmers End, residential customers in the BR3 area can also turn to us for specialised skip hire at excellent prices. We operate skips of various sizes and load capacity making the service versatile and convenient for customers. If you don’t want to be paying top money, but need top quality services, it is not an oxymoron, but one of our essential policies – fair pricing without compromise on quality or efficiency of our work. We quote each customer individually as per the scale and complexity of their requirements. We offer custom tailored pricing on all services, and only charge for rubbish we actually remove. No hidden fees, no unmentioned additional charges. Elmers End is a suburb of southeast London. The area is the former site of a large industrial estate, featuring a sewage works. Most of the industrial estate is now gone but the site of the sewage works is believed to be contaminated with heavy metals thus making it unsuitable for housing construction. As always in London, there are two theories as to where the name Elmers End originated from. The more romantic and exciting one is that a famous highway robber by the name of Elmer was hung at the nearby crossroads i.e Elmer met his end here thus Elmers End. The other, more plausible, and likely to be historically correct story, is that there were numerous elm trees growing at one stage in the area so the area was named Elmers End. Which of the two is actually true will remain unknown, but Victorian era railway companies were notorious for getting place-names wrong, and coming up with outrageous grand names for their stations, so the origins of Elmers End will remain a secret for now.